My weekend has been spent drinking hot chocolate, cups of tea & home made hot apple & cinnamon cider. Anything warm saying its so freezing outside.. Winter seems to be here with the caution of snow and minus temperatures in the evenings.. Which makes taking any outfit photos more like an extreme sport of who can withstand the cold the longest without a coat on & without looking like you have lock jaw! 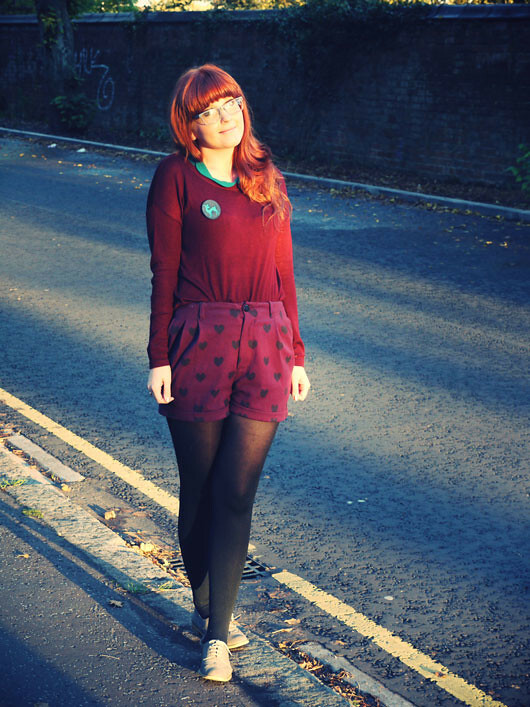 Knit: H&M, Peter pan collar top: Primark, Shorts: H&M, Brogues: M&S, Deer Brooch: Red Door Gallery. 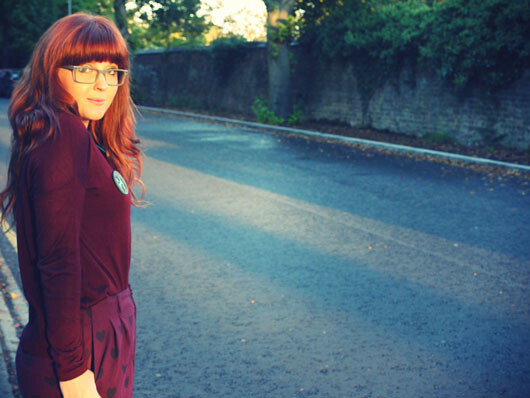 Glasses: Gok Wan. The hot apple & cinnamon cider sounds so good! Perfect for this weather. beautiful outfit and gorgeous photography too! I'm in love with the shorts! 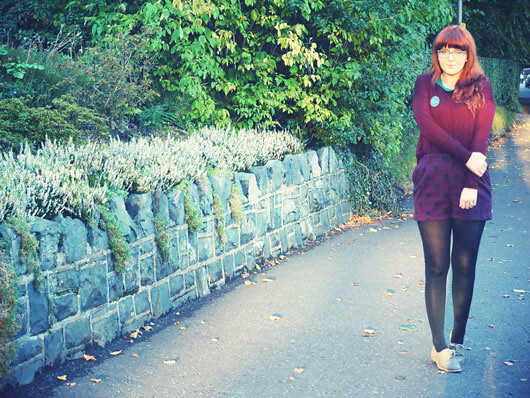 All of the burgundy against your stunning hair colour is amazing! Love those shorts! you are so very pretty!! love your outfits! I've been crazy for hot drinks lately too, I love this weather though. You look lovely, those shorts are so cute! I'm always a sucker for a heart prints, I really love those shorts and wine colours! Vicki, is it me or do you look frozen??? Cute post and I like the sun! Them shorts are incredibly cute!! That is pretty much all my outfit photos at the moment - keep going as long as possible til I'm too cold to do the fastenings on my tripod, then home! You don't give away that it's cold though - you look lovely as always! wow, are these shorts H&M?! yay, i'm so excited. i wanna buy it <3. you look so cute.. This outfit is gorgeous. 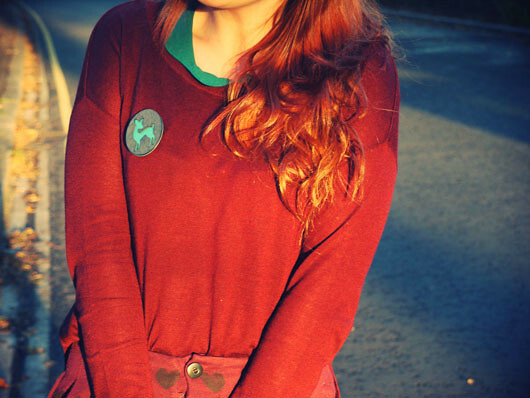 I feel like the jumper and short colours almost shouldn't work together, yet they really do!